Our next stop in Minnesota was in St. Paul and Minneapolis, the Twin Cities. We stayed in Lebanon Hills Park campground. One day, it hailed! Look closely and you’ll see hail on the top of the Jeep. People.. it’s JULY! When we arrived Saturday, we set up quickly so we could visit the Capitol building in St. Paul. We usually try to visit state capitols on Sundays because there is no traffic, in the downtown areas (less people and ample parking) but we have a full day planned for Sunday so we had to visit today. It wasn’t too crowded so it worked out fine. We were able to catch a free guided tour, which enabled us to go up to the roof and see the Quadriga (four golden gilded horses that sit at the base of the dome). Capitol tours are a great way to learn about the Capitol’s history, art and architecture. The Minnesota state capitol is the second-largest self-supported marble dome in the world. The first is St. Peter’s in Rome (which Chris and I saw on our European tour right after we were married). I’ll share one interesting fact the tour guide told us. When the Civil War began, Minnesota’s governor immediately promised President Lincoln a regiment of 1,000 volunteer soldiers from Minnesota. These were the first troops offered to fight for the United States during the Civil War. The stairs pictured here are not supported by anything other than the attachment to the wall. The star on the center of the rotunda area has 4 M’s on it. This is the best science museum we have visited to date. In the dinosaur exhibit, they house one of only four real Triceratops on display in the world and the largest complete specimen on display. They also have a great human biology section, which just so happens to be the same unit we are studying in school. The cell lab was a perfect addition to our unit study. The girls put on a lab coats, goggles, and gloves and used real lab equipment to perform biology experiments. They chose DNA extraction, blood typing and enzyme labs. There were several other labs to chose from but we just didn’t have time for it all. There was a real mummy on display in this section that we thought was really cool. Other exhibits we enjoyed were; Sportsology, Lego, Mental Health, Mississippi River and one on race. We visited once with Chris and then another day without him to do more labs. Mississippi National River Visitors Center is located inside the Science Museum’s lobby. I found this very unusual. The girls earned their Mississippi River Junior Ranger Badge by tying knots, learning about Bald Eagles and studying the map of the Mississippi which we have be to the beginning and end of, as well as several spots in the middle. On Sunday we went to The Nook for lunch. “Diners, Drive-Ins and Dives” has The Nook on it’s list of the 15 best burgers. We have eaten at several of the restaurants that have been featured on this show. Chris order the ‘Guy’s Big Bite’ which is named after the show’s host, Guy Fieri. The burger is stuffed with pepper jack cheese and topped with bacon, roast beef, and cheddar. The girls and I had the original Juicy Lucy, which is a cheeseburger with the cheese in the middle instead of on top. I’m not a cheese burger lover but this concept had me intrigued. I loved it! Word of caution.. the melted cheese core is HOT! Since opening in 1988, this Garden has showcased more than 40 works from the Walker Art Center’s collections, including the iconic Spoonbridge and Cherry, by artist Claes Oldenburg. We had fun with the Spoonbridge and Cherry; a 7000 lb sculpture of a large spoon with a cherry suspended on the rim. Water exits the cherry from both ends of the black cherry stem. We read a stat that if you went inside all the stores for 10 minutes you would spend 86 hours in the mall. We ate dinner and visited the two story American Girl doll store and the Lego store. That is all we had time for because the mall closes early on Sunday nights. We stopped at the Lego store and built Legos just because we can! The girls built figurines and Mackenzie bought them; using her VIP card! Check out the art work of the sunset and the moose, they were made from one by one’s! Wednesday, we dropped Chris off at Dan’s house (another co-worker) so he could have a meeting with the sales team. The girls and I headed over to check out the Como Zoo. We weren’t expecting much because this zoo is FREE for everyone. It was an unexpected delight! Why is it that every zoo has the flamingos at the front right when you walk in? I am seriously wondering if there is a reason for it because all the zoos we have visited so far have them in the front. One of the more interesting things at the Como Zoo is the a special carousel. The original carousel was built in 1914 in Philadelphia, PA, and shipped to Minnesota, where it was put into immediate use at the Minnesota State Fairgrounds in St. Paul, where it sat for decades. It changed owners and then sat unused until it was purchased and restored. You can buy a $2 ticket to ride on this little piece of history. The lady standing in front of us in line was so excited because she was there to ride on it for the first time in 50 years. They still have 59 of the original wood carved, hand painted horses. Abby sat on #1 of the 59 because she was first in line and knew exactly where to go. After work, Chris played golf at Legends with Jon, Dan and Luke and then they stopped by to tour the rig. The girls and I had a Little House on the Prairie marathon. Thursday night all of us went to the Mall of America to ride some rides! After 5:00pm the tickets are discounted. We stayed until 9:30pm when it closed. We were able to ride several of the rides twice! We really did enjoy this amusement park, it exceeded my expectations. We took a break to eat dinner at the food court so we had more time to play. Benefits of Indoor Amusement Park: no worrying about rain or snow, no need to wear sunscreen, rides are close together so you don’t have to walk much, and it’s air conditioned. Chris and Mackenzie were crazy enough to get on this brain scrabble. Teenage Mutant Ninja Turtles was our favorite ride. Fun facts about the location of the Mall of America. It is located on the site of the old Metropolitan stadium. There is a brass plaque, on the floor among the amusement park rides, of the home plate located right where the real home plate once sat. While on the log flume ride, you can see a red chair mounted to the wall that denotes the precise landing spot of the longest homer ever hit at the “Old Met”. Friday night we went to a Twins game at Target Field. Jon gave Chris advice on where to park and take the metro rail to the game. Public transportation is always an adventure on it’s own. From trying to decipher the different lines and directions to watching all different types of people loading and unloading at each stop, has us wanting to do it more often. 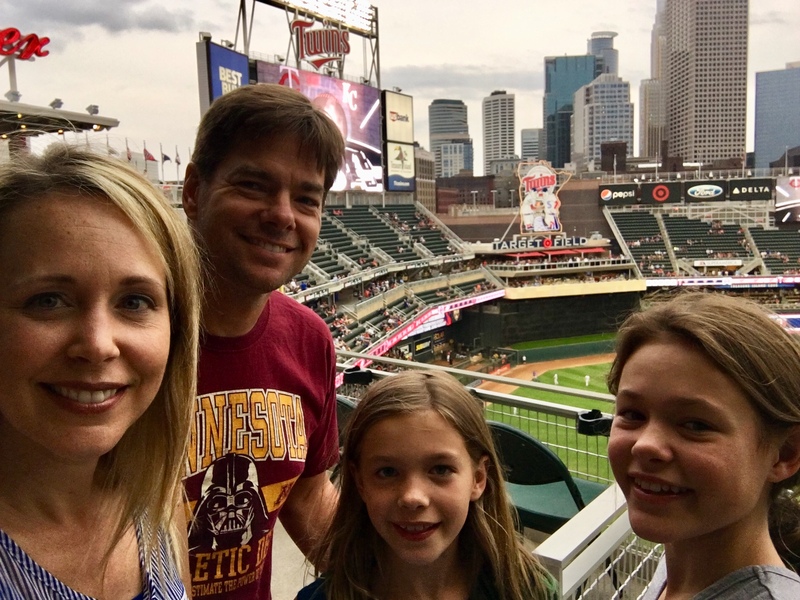 We were stoked about the baseball game and the girls loved the fact that it was the Target field (one of their favorite stores). After we had our classic hot dogs the rain came in. The rain came in during the 4th inning while we were under shelter waiting in line for a VR game. We sat and waited for an hour under a shelter before deciding to go home. Mackenzie needed new hiking boots so we found the biggest REI store we have ever seen. It’s one of their flagship stores.